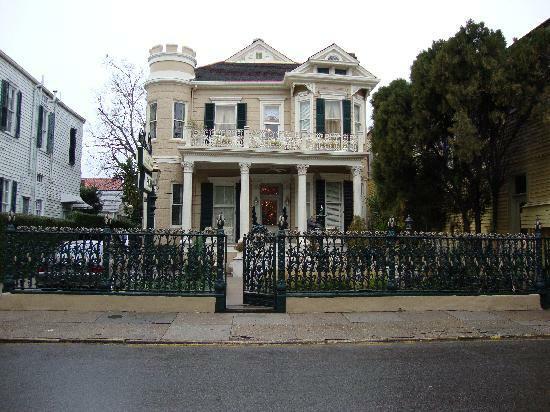 Is the Cornstalk Hotel in New Orleans, Louisiana haunted? The Cornstalk Hotel was the early 1800's home of Judge Francois Xavier-Martin, first Chief Justice of the Louisiana Supreme Court and author of the first history of Louisiana, where Harriet Beecher Stowe stopped and was inspired to write Uncle Tom's Cabin from the sights at the nearby slave markets. Surrounded by a unique and intricate 165 year-old "cornstalk" cast iron fence, it is now a lovely hotel in the Victorian tradition of elegance. The building still functions today as an open hotel. The stories of ghostly goings on here are rather different from any other location, apparitions of children have been witnessed running and playing all over the house and grounds, as well as the sounds of children laughing and light footsteps in the hall ways when no one's there. What makes this location different from any other though is due to the stories of guests who have stayed there. On several occasions people have checked into the hotel with a camera on them, not an uncommon thing to do in a tourist area. But upon getting the photos developed they have found there to be photos of themselves lying asleep in the bed they stayed in at the hotel. Many people can't explain this as they were alone at the time of their stay. Maybe the spirits of the children have a passion for photography?